Toby Jones Fishing: Bees and Bass...! Thursday afternoon I hit a small pond that I hadn't been to since I was a little kid. My fishing time was cut short because somehow I ended up getting into a nest of yellow jackets, and was rewarded with a nice sting on my ear lobe, lol. 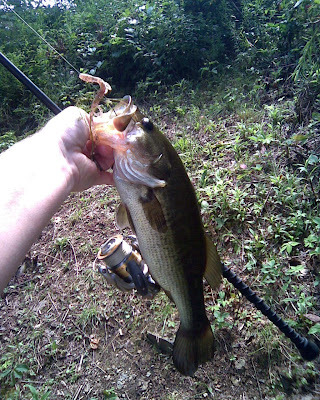 Still the bees didn't chase me away before I was able to get a couple bass, with one nice one about 17 inches. Later (thursday evening), Marianne, Lucy, my nephew Gabe, and I hit another local pond. Gabe and Bailey had gotten Marianne a new lure as a present--a pink Dancin' Tadpole--her favorite lure! We needed a good excuse to try it out. Fortunately, we had a great time at the pond and we all caught fish. Marianne got a real nice bass on her new tadpole, I got a couple small ones, and Gabe caught the lunker of the trip--a 19 1/2 incher! What a beautiful bass i t was. Congratulations Gabe! On Friday Gabe, Bailey, my Dad and I took a drive over the Shade Mountain to do some fishing in Middle Creek by Faylor Lake. We found a bunch of largemouth bass, sunfish, and rockbass. I think I had the largest of the trip, which was a bass around 14 inches... not bad for a creek bass! We all caught a bunch of fish and had a great time. Unfortunately, I didn't have my camera along so there isn't any pics from this trip. I can't wait to go back though, wading the creek with my Dad and nephews was a lot of fun!